This content was published: May 27, 2011. Phone numbers, email addresses, and other information may have changed. It was during the fall 2010 Sylvania ASPCC Club Fair that Soufiane El Moussi, this year’s ASPCC programs director, was struck by a comment made by a student checking out the fair tables. 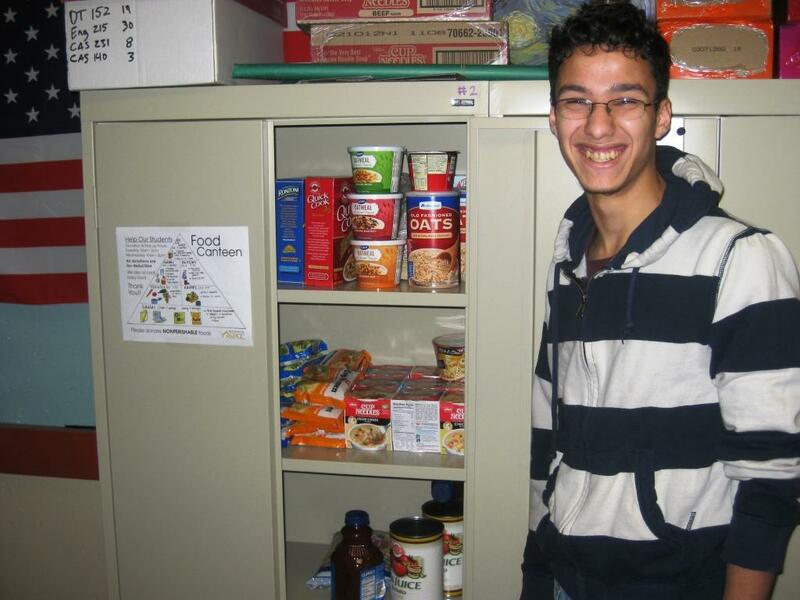 Soufiane El Moussi gives a tour of the Sylvania ASPCC food canteen, where several shelves are stocked with canned and non-perishable food for students in need. Over the rest of the fall term, Sylvania’s student government officers researched how the Rock Creek Campus had initiated its food canteen, up-and-running since 2008. Sylvania developed a similar model, and with seed funding from the PCC Foundation and ASPCC to stock shelves with canned food and non-perishable goods, its food canteen opened with a soft launch in early February. 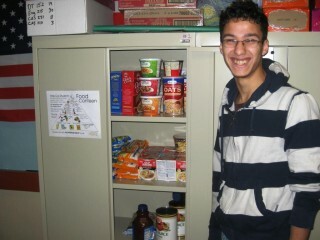 Within two weeks, Sylvania’s ASPCC had served more than 25 students. Student officers created a strategic game plan: For distribution, donations, food drives, marketing, and a spring term “grand opening.” Next, a team of students from Sylvania’s ASPCC, Phi Theta Kappa Honor Society, the Multicultural Center and the Women’s Resource Center approached local grocery stores for donations. Two Thriftway stores, on Oleson Road and Scholls Ferry Road, and King City’s Grocery Outlet jumped on board with donations and gave PCC students the nod to solicit customers outside their stores to inquire about donations. With its shelves stocked with balanced and healthy food choices based on the food pyramid recommended by the United States Department of Agriculture, the canteen’s grand opening took place April 12 and 13. Operating out of the ASPCC offices on the lower level of the College Center Building, the canteen’s regular hours of operation are from 10 a.m. to 2 p.m. every Tuesday and Wednesday, although students aren’t turned away if they come at other times. 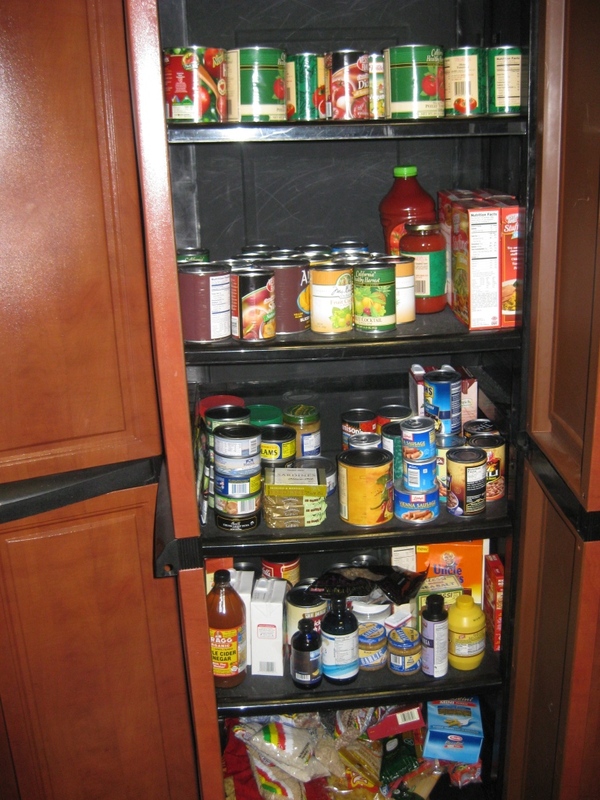 Students can access the canteen three times per term using their G numbers to obtain canned and non-perishable food items for themselves and their family members. The honor code is the rule abided by when students are asked the number of family members in need of food as part of the request. As of the third week in May, Sylvania’s food canteen has served 117 student requests since its grand opening. Well-stocked shelves in the Sylvania Campus food canteen. The canteen will continue to operate for the rest of the term, before closing for the summer. It will re-open for the fall term, and given such positive response, the ASPCC has created a coordinator position for the canteen program to ensure continued success. Other nearby stores – Safeway on Barbur Boulevard and Barbur World Foods – have committed to helping in the fall, and Sylvania faculty and staff are encouraged to donate in the 2011-2012 academic year if they can. A strong need coupled with positive response at both Sylvania and Rock Creek has led Southeast Center and Cascade campuses to follow suit and launch canteens, as well. Locations are: Sylvania (ASPCC Office, Room 101, College Center Building); Rock Creek (Women’s Resource Center, Room 103, Building 2); Southeast Center (ASPCC Office, Room 151, Mt. Tabor Hall); and Cascade (ASPCC Office, Room 01, Student Center Building). For more information, contact El Moussi at (971) 722-4930, or Soufiane.elmoussi@pcc.edu.